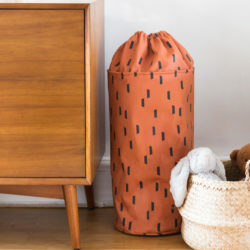 Stuck in a home décor rut? Spending so much time at home staring at the same old walls can be great motivation to give your interior spaces a DIY facelift, but before you embark on your next home renovation adventure, we have a project you’ll want to do first– consider it a warm-up! 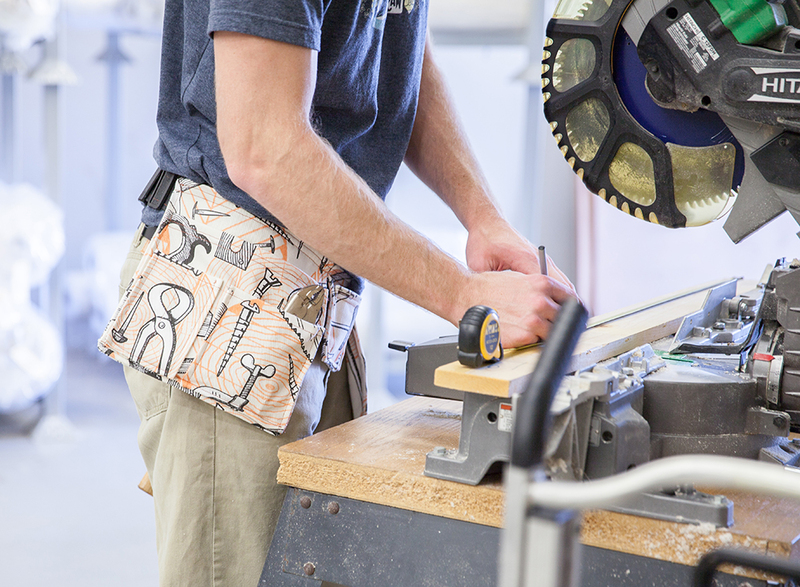 A Dogwood Denim™ tool belt will help you keep everything you’ll need at your fingertips and it makes the perfect customizable gift idea for Mr. or Mrs. Fix-It. This project has a lot of pieces, but we promise it’s worth it to have so many compartments to sort all your odds and ends in one place. Grab yourself a yard of Dogwood Denim and let’s get started! Serge or zigzag stitch the edges of all of your cut pieces. This will help prevent fraying during wear and washing. 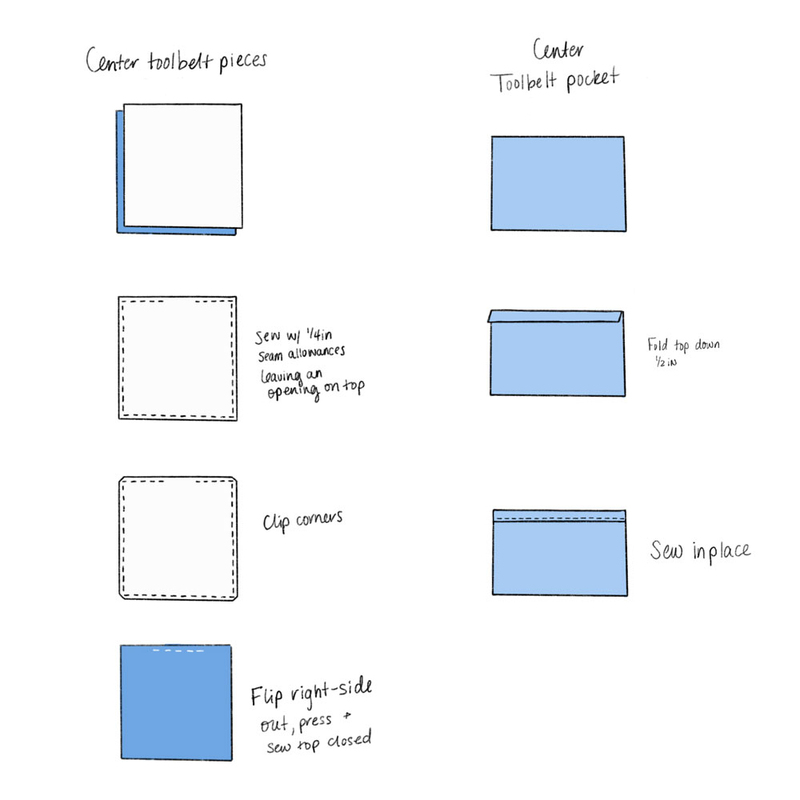 Pin both sets of the large square pieces (10 x 10in) together with right sides facing, making sure your design is oriented the same way. On one of the sets of squares, sew around the edges with ¼ inch seam allowance, leaving an opening at the top. Clip your corners and turn right side out. Press the edge, and sew the opening closed. This stitch line will be hidden later. On the other set, mark a 3 inch opening starting 2 inch from the top of one side of your squares. 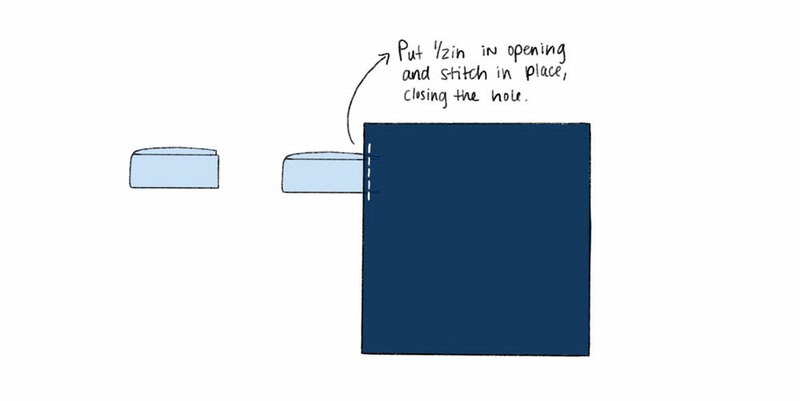 Sew around the edges with a ¼ seam, leaving an opening between your marks. Clip your corners and turn right side out. Press the edge with your opening so that the ¼ inch seam allowance fits neatly inside, but do not stitch the opening closed yet – it will be used to attach your hammer strap. Take your hammer strap rectangle (7in x 3 in) and fold in half longways with right sides facing. 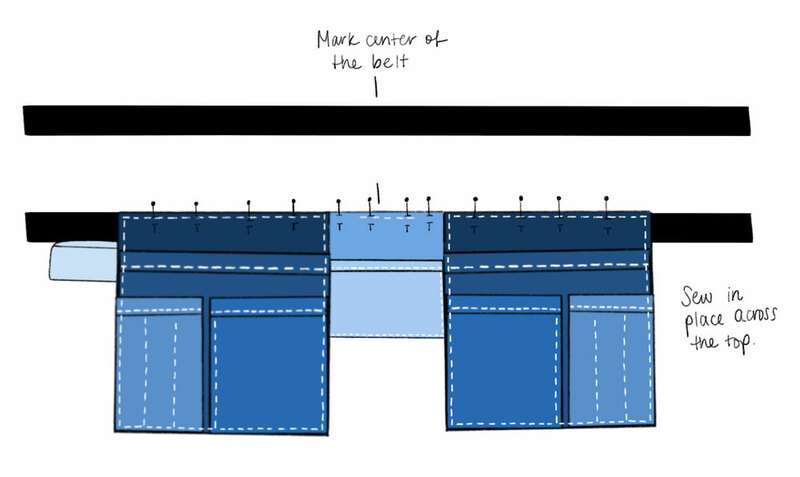 Sew with a ¼ inch seam, making sure to leave one short end open. Turn right side out. Pinch and roll your hammer strap so that the seam is centered. Fold the fabric in half, matching the short ends. The seam should now be on the inside. Slide the short edges into the side opening on your tool belt base about ½ inch with the loop on the outside. Pin in place, and sew the opening closed. This stitch line will be hidden later. 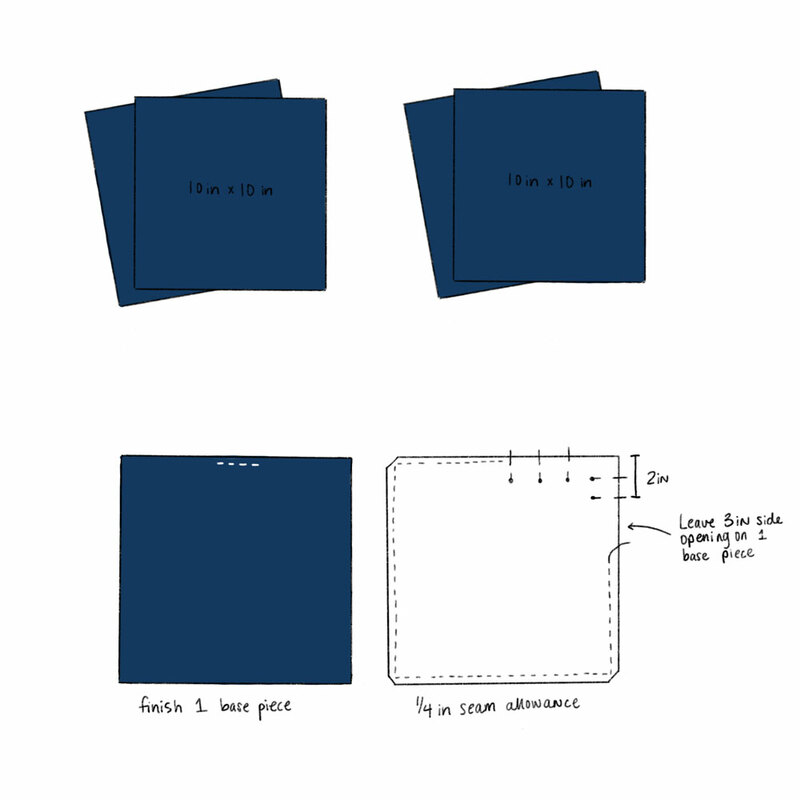 Take one of your large pocket pieces and fold the top edge over ½ inch, right sides touching. Stitch in place to create the top of your large pocket. 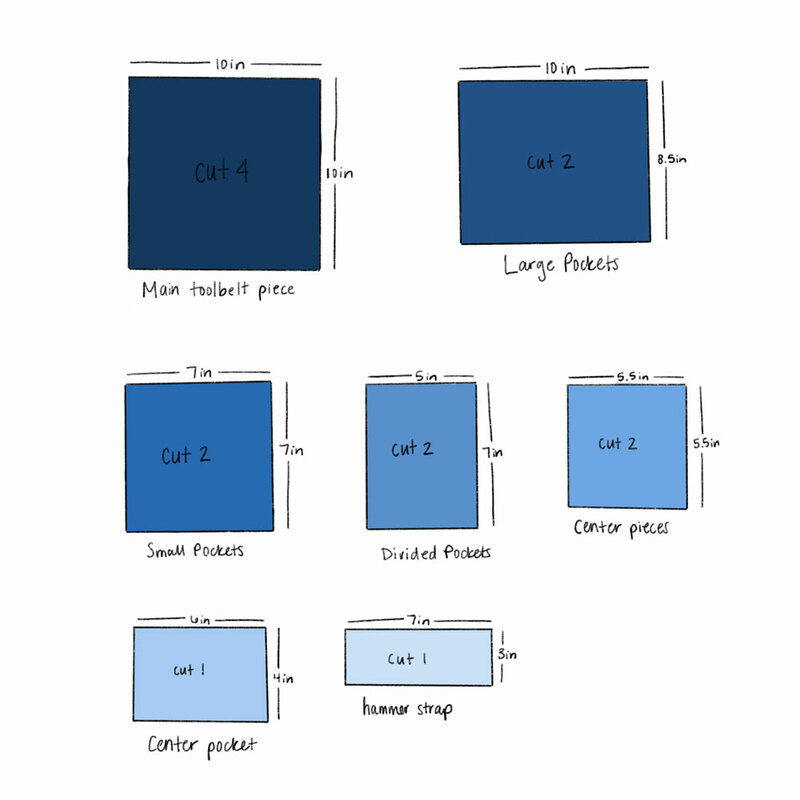 Repeat this process with one of the small pocket pieces (7 x 7 in) and one of the divided pocket pieces (5 x 7 in). Fold ½ inch on both sides and the bottom of your large pocket piece to the wrong side. Press in place. 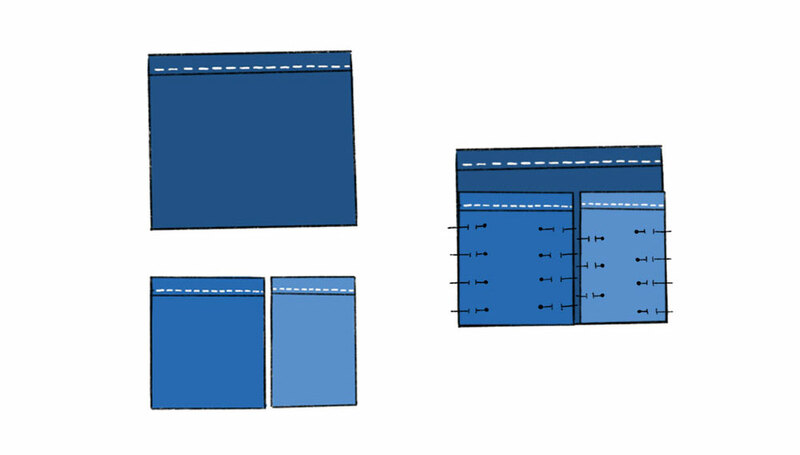 Repeat with the divided pocket piece and the small pocket piece. Place both the small pocket piece and the divided pocket piece next to each other in line with the bottom edge of the large pocket piece without the hammer strap. 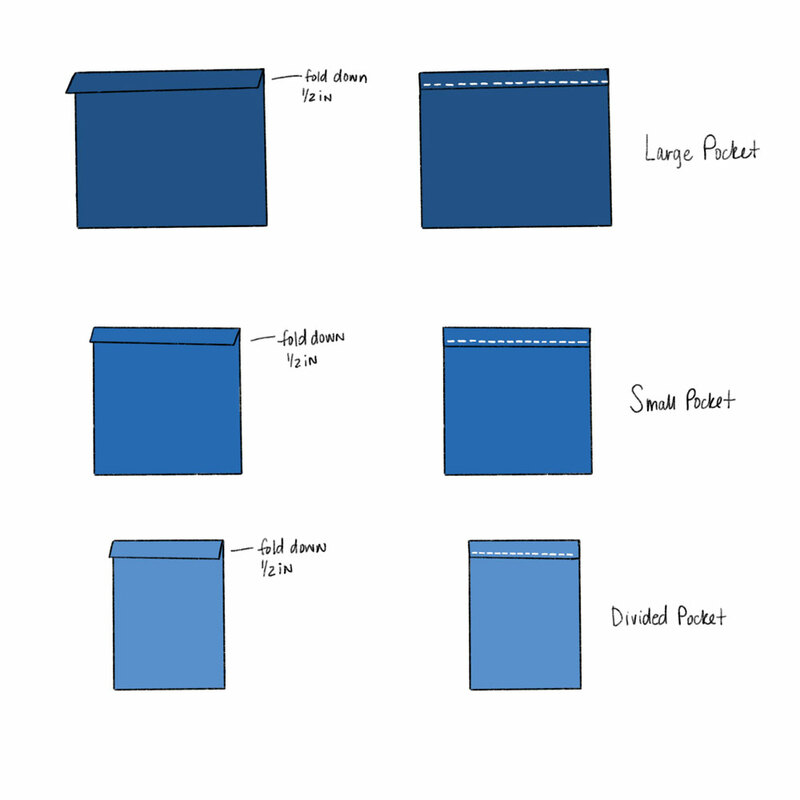 The outside edges of each pocket should line up with the outside of the larger pocket, with a small gap in between them. Pin the two smaller pocket pieces in place. Stitch along the inside edges of the small pocket pieces ONLY (the edges next to each other). Do not stitch the outer or bottom edges yet. On the narrower pocket, divide and mark the width into three separate sections, and stitch two vertical lines to create divided slots in your pocket. Pin the large pocket piece to one of the the main tool belt pieces with bottom and side edges lined up. Topstitch all the way around the main tool belt piece, being careful to sew over the stitches from closing the gap in the top. Pro Tip: If your sewing machine seems to struggle with any particularly thick spots, manually turning your machine wheel will help the needle get through smoothly. 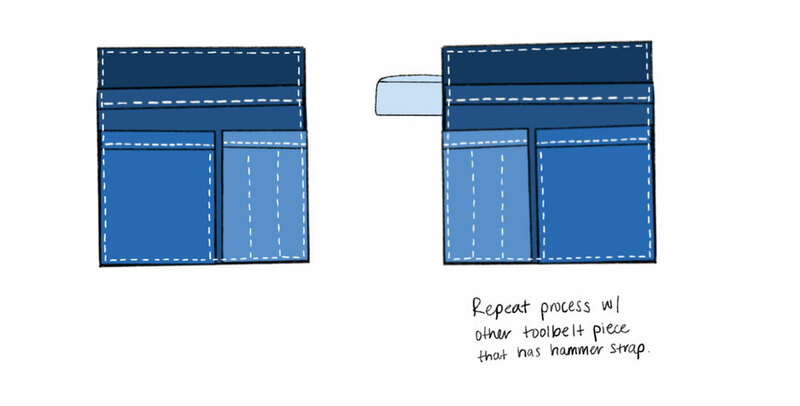 Pick up more tips and tricks for sewing with Dogwood Denim here and here. You should now have the two outer toolbelt pieces completed. 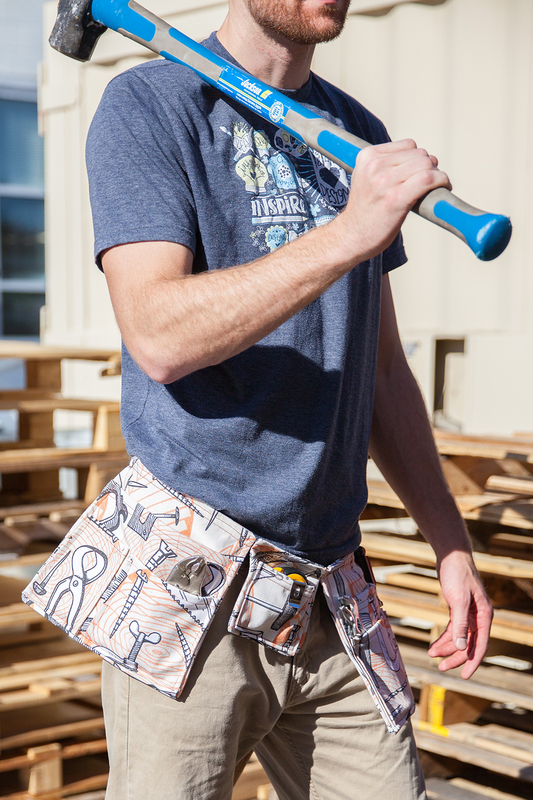 Place your two center tool belt pieces (5.5 x 5.5 in) together with right sides facing. Stitch together with a ¼ in seam allowance, leaving an opening at the top. Clip the corners, and turn right side out. Press and sew across the top edge to the close. Fold ½ inch over on the top of your center pocket piece (6 x 4 in), and sew in place to create the top of the pocket. Fold and press ½ inch in on each of the sides and bottom. Pin onto the center tool belt piece with the bottom edges aligned, and top stitch in place. Cut a piece of webbing to your waist size plus an additional 6 inches. Thread about 2 ½ inches of one end of your webbing through one side of your buckle. Fold ½ inch of the end under, and stitch to secure your buckle in place. Sew additional lines or an X onto your webbing to add stability between the folded edge and the buckle if desired. Repeat this process with the other side of the webbing and the other half of the buckle. Measure and mark the center of the belt with the right side up. Place the center pocket piece on top of this mark, with the top edge lined up with the top edge of the belt, centered. Pin in place. Place each of the other pocket pieces on either side of the center piece, with top edges in line with the top of the belt. Pin in place. Make sure your hammer strap is on the outside edge when you arrange these pieces. Sew across all three pieces, attaching them to the belt, taking care to stitch over any existing stitch lines. Add a second line of stitches below for stability if desired. Pro Tip: If you’re feeling inspired and a little adventurous, add rivets to the corners of your pockets where they meet the belt for extra stability and a more professional look. Congrats, you made it through all those pockets! 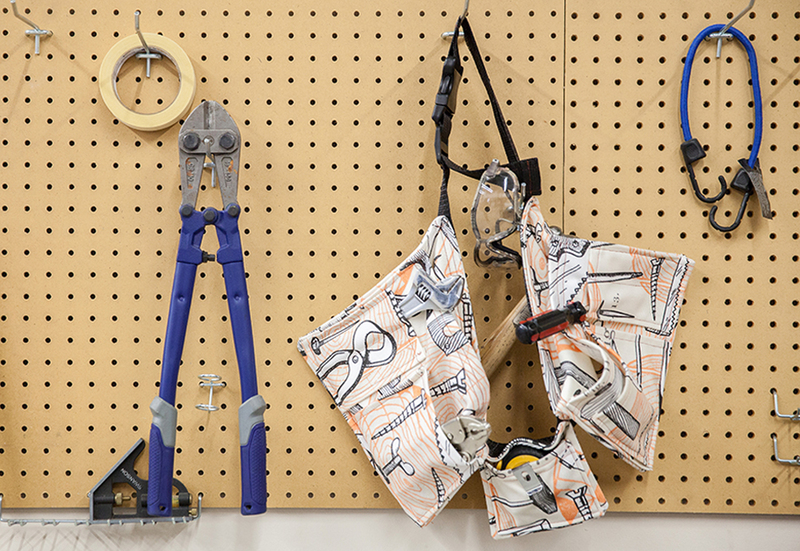 Your belt is done and ready to fill up with tools to help you take on your next project. 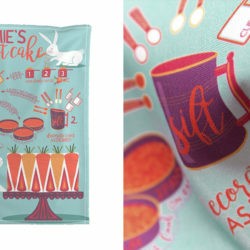 Find even more apron tutorials to get you ready for your next project. 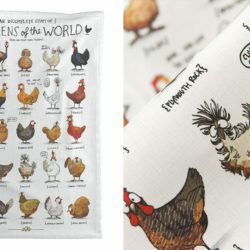 Don’t forget to strike a pose and tag #spoonflower to show off your handiwork! I\’d really like to make this but can only find 2\” webbing and buckles. 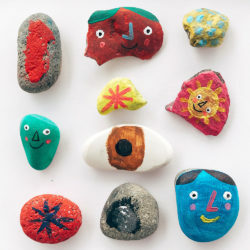 Could those be used? How would I adapt the pattern?